Restaurants were slow in building their popularity in 19th century England. This was at least in part a function of England's tavern culture: public houses served inexpensive food and often staged bills of musical and variety entertainment. Meanwhile, among the upper classes, there was a pronounced trend for hosting dinner parties in the home, providing a gastronomic experience even the best restaurants would struggle to equal. 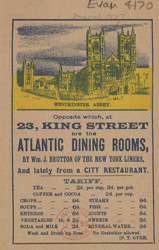 Restaurants such as The Atlantic only really became popular towards the end of the century.